Above: The cruise terminal building in Basseterre. Above: The current cruise ship pier at Port Zante. 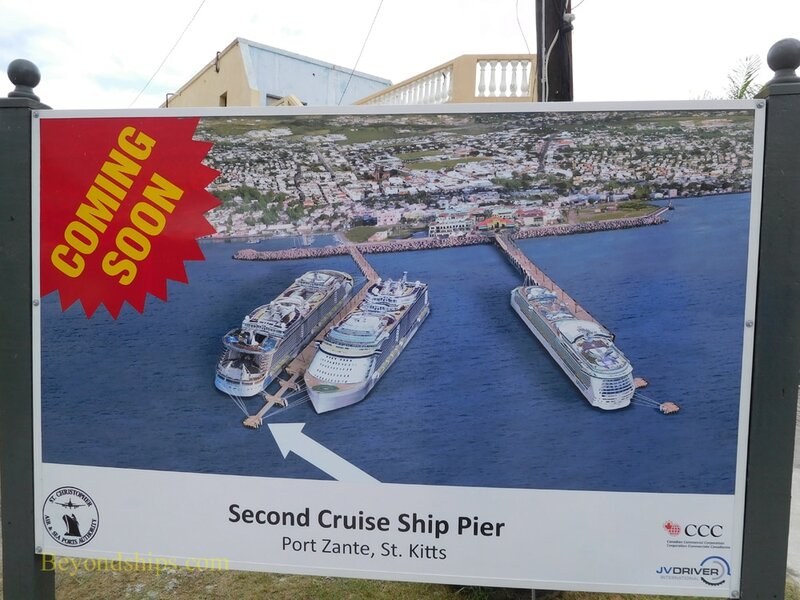 ​Below: A sign announcing the construction of a new pier at Port Zante. Most cruise ships calling at St. Kitts dock at Port Zante, which opened in 2005. Built on land reclaimed from the sea, the cruise port consists of a large finger pier, a welcome center and a large duty-free shopping area with cafes and restaurants. Port Zante is within walking distance of the center of Basseterre. No beaches are located near the port. The pier at Port Zante is capable of handling two large cruise ships at once. If more than two ships are calling, the other ships will either use the cargo port or tender passengers ashore. Plans call for the construction of a second finger pier at Port Zante. ​Because of the increasing popularity of St. Kitts, the commercial cargo pier outside of Basseterre is often used by cruise ships. Even with this, it is not uncommon to see ships anchored and tendering off of St. Kitts and Nevis. 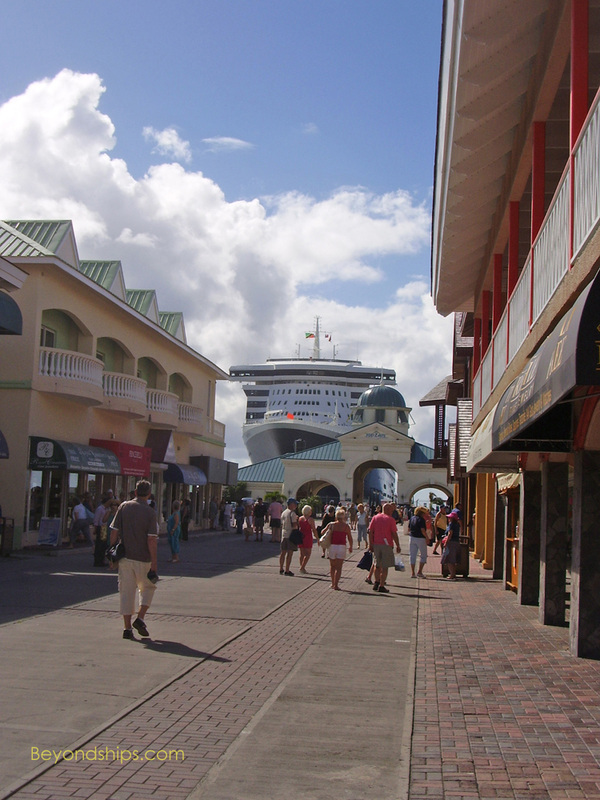 St. Kitts is a popular port and during the winter months a considerable number of cruise ships call at the island. Fewer ships call the closer you get to the summer. Left: The commercial pier across the bay from Port Zante is now often used by cruise ships. unavailable, cruise ships will tender passengers ashore. 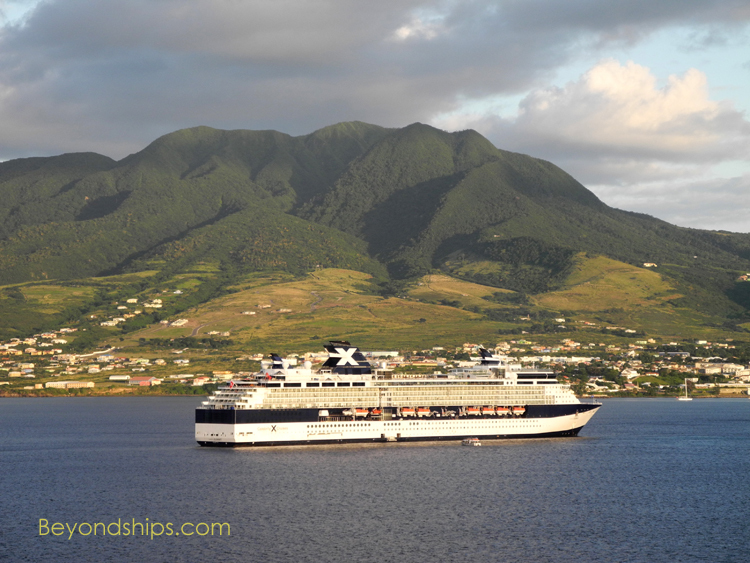 Here Celebrity Summit is tendering off of Basseterre. 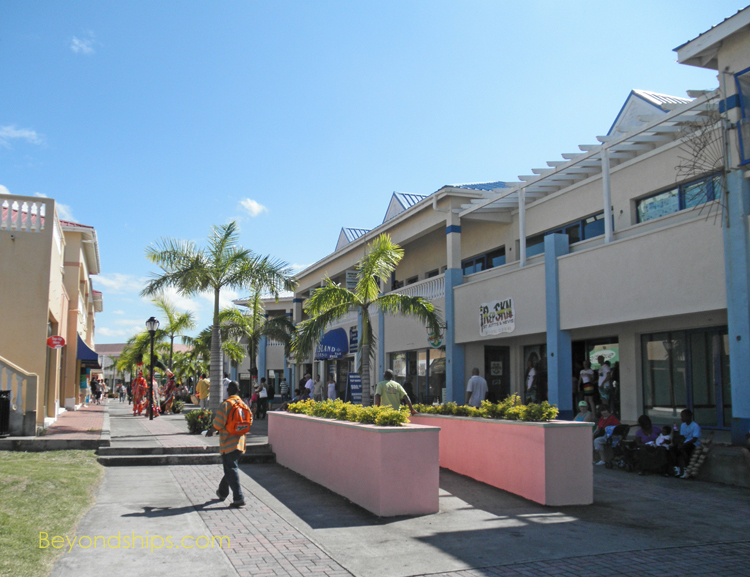 The shopping area is a new complex of buildings that lies between the cruise ship pier and the traditional gateway to Basseterre: the Old Treasury Building. Within this area are numerous jewelry stores and many of the major chain stores that one encounters in the more popular Caribbean ports. This is a duty free zone. Beyond the Old Treasury Building in the original part of Basseterre, there are local shops. They are mostly spread out along Bay Road, Fort Street and Liverpool Row. Prices are generally fixed although some local vendors may bargain. The currency is the Eastern Caribbean Dollar. U.S. bills (but not coins) are accepted by most stores and businesses. Change is given in Eastern Caribbean currency. Major credit cards are widely accepted. 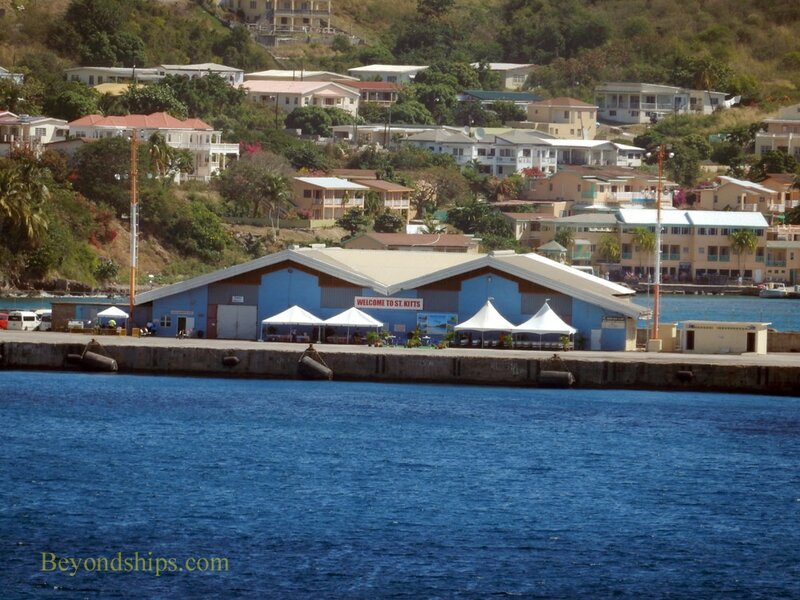 The sights of Basseterre are within walking distance of the cruise ship pier. Areas such as The Circus can be quite busy with automobile traffic. For going further a field, most independent passengers (i.e. those not on a shore excursion) use taxis. Taxis have the letters “T” or “TA” on a yellow license plate. The taxis are not metered so it is best to agree on the fare before beginning the journey. There are also mini-van buses that take Kittitians and visitors along the coast road. Buses have a green license plate with the letter "H". It is possible to rent a car. However, you must obtain a driving permit to drive on St. Kitts. They can be obtained at police stations and from the car rental agencies. St. Kitts follows the British system of driving, i.e., they drive on the left.